Ross Brawn was "a little bit shocked" by the response Liberty Media received from the teams over their proposed 2021 engine regulations. Cape Town - Flavio Briatore doubts Lewis Hamilton will ever join Sebastian Vettel at Ferrari, saying he "cannot co-exist" with the German. Hamilton and Vettel have locked horns in this year's championship, however, for the most part it has remained amicable between the protagonists with Vettel one of the first to congratulate Hamilton on his title success. But while this year's campaign as seen them battle as Mercedes and Ferrari drivers, Hamilton has been linked to a move to the Scuderia in the future. Briatore says it would never work and instead believes his driver Fernando Alonso would be a better fit. 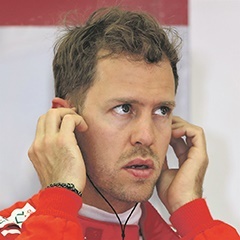 "I do not think so, he cannot co-exist with Vettel," Briatore explained to Italian broadcaster Rai. "Alonso is still the best guy. "With him and Vettel, Ferrari would have 100 per cent won the Constructors' World Championship."